A police car drives in the streets of Strasbourg, France, after a shooting broke out on Dec. 11, 2018, killing at least one and injuring at least ten others, according to authorities. 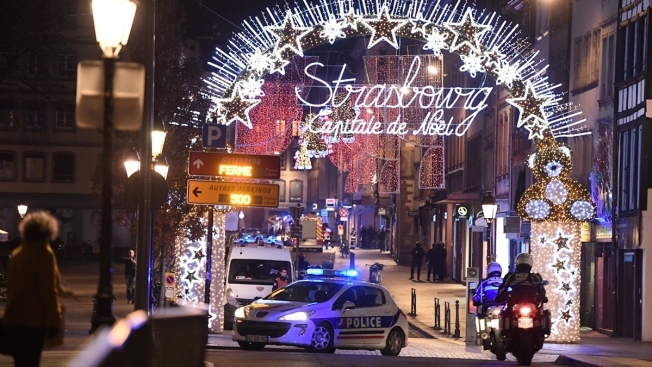 A man who had been flagged as a possible extremist sprayed gunfire near the city of Strasbourg's famous Christmas market Tuesday, killing three people, wounding up to a dozen and sparking a massive manhunt. France immediately raised its terror alert level. It was unclear if the market — a popular gathering place that was the nucleus of an al-Qaida-linked plot in 2000 — was the intended target. The assailant got inside a security zone around the venue and opened fire from there, Mayor Roland Ries said on BFM television. Authorities did not give a motive for the shooting, though prosecutors said they had opened a terrorism investigation. Strasbourg, on France's eastern border, is home to the European Parliament, one of several places that was locked down after the shooting. Authorities said they had identified a suspect. The prefect of the Strasbourg region said the man was on a watch list of people who had potentially been radicalized. Interior Minister Christophe Castaner, who traveled to Strasbourg, said the suspect, not named, had been convicted in both France and Germany for crimes unrelated to terrorism and served time. He did not elaborate. Hours before the shooting, French gendarmes went to the suspect's home to arrest him, but he wasn't there, Stephane Morisse of police union FGP said. They found explosive materials during a search, he said. France, where most of Europe's worst terror attacks of recent years took place, was raising its terror alert level and sending security reinforcements to Strasbourg, Castaner said early Wednesday. The attack came two years after a Tunisian man drove a hijacked truck into a busy Berlin Christmas market, killing 12 people. Strasbourg, which promotes itself as the "Capital of Christmas," on the border with Germany, about 500 kilometers (310 miles) east of Paris. The market, France's largest, is set up around the city's cathedral during the Christmas season. Some 350 security forces and two helicopters were searching for the assailant, who had been radicalized for "several years" and confronted law enforcement officers twice, exchanging fire, while he "sowed terror," Castaner said. More than seven hours after the bloodshed, the regional prefect said that 11 other people had been injured, five seriously, downgrading the minister's earlier count of 12 injured. The shooter was also shot and wounded by soldiers guarding the Christmas market, according to Stephane Morisse of police union FGP. French military spokesman Col. Patrik Steiger said the shooter didn't seem to be aiming at soldiers patrolling in and around the market, but appeared to target civilians instead. Freelance journalist Camille Belsoeur was at a friend's apartment when they heard the gunfire, which she at first mistook for firecrackers. Other soldiers yelled for people to stay indoors and shouted 'Go home! Go home!'" to those outside, he said. President Emmanuel Macron adjourned a meeting at the presidential palace Tuesday night to monitor the emergency, his office said, and at midnight presided over a meeting at the Interior Ministry's crisis center. The Paris prosecutor, in charge of anti-terror probes in France, was also in Strasbourg. The prosecutor's office said the investigation was being conducted on suspicion of murder and attempted murder in relation with a terrorist enterprise charges, suggesting officials do not exclude links between the shooter and an extremist cell. Authorities had urged the public to remain indoors at the height of the drama, and people out dining were kept in restaurants for hours, along with lawmakers at the European Parliament, and thousands at a sports stadium. They eventually were allowed to leave, with those with nowhere to go housed at a gymnasium, the prefect tweeted. The market was closed Wednesday and festivities cancelled in a sign of mourning, Mayor Roland Ries said. Flags in Strasbourg were ordered at half-staff.